Ever wished you could pop a pill, wave a wand, or say a powerful prayer to unleash an extra surge of creativity? While pharmaceuticals, magic, and heartfelt pleas to higher powers might have their place, today I look to technology for that special creative spark. Here are my five favourite apps and websites to boost creativity! I’ve written before about why writers should use Pinterest, so today I’ll just say it’s one of my favourite websites and most-used apps because it’s fun, useful and highly creative! Pinterest is free and the app interface is top-notch–two nice bonuses. So how does Pinterest fire my imagination? * I create vision boards for my WiPs (Works in Progress). * I follow bookstores, libraries, writers, publishers and peak industry organisations and collate articles about writing. * I source information and articles on the creative process. * I save books with Compelling Covers. * On my Face Catalogue board, I pin interesting smiles, gorgeous eyes, quirky expressions, intriguing hair colour, etc., for later use, when I flesh out my characters’ features. Storyboarding is a fundamental tool of screenwriters. 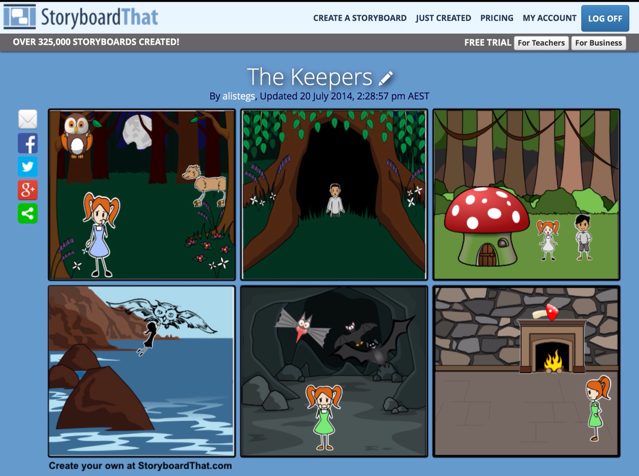 Storyboard That (an HTML 5 website that doesn’t need an app) lets novel and picture book writers harness the power of storyboarding. Shifting from words to images can be a handy strategy to break writer’s block and soar in new directions. If you find yourself stuck or just want to play around with your scene sequence, try this intriguing app. It’s heaps of fun–but a little time-consuming. The free version is pretty limited, giving you a choice of either 3 or 6 frames and no privacy (A good thing to know so you don’t accidentally release your top-secret project a little earlier than you planned). $35 a year gets you better options including the ability to keep your images under wraps. The picture to the right is my first (rather lame!) attempt, showing 6 scenes from my latest novel. 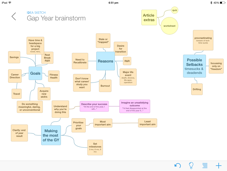 There are a gazillion mind-mapping apps available, but I like this one because the results are clean and neat enough to add to PowerPoint presentations or include in project outlines. You can easily email a map or share a screenshot. You can also flip between a diagram and an outline. I use Idea Sketch as a starting point when planning blog posts, freelance articles, and curriculum projects. I’ve even used it to map out a projected series of children’s mystery novels. The picture here is an old map I drew when writing a series of articles on Gap Year experiences. The free version allows a limited number of maps. $5 for the premium app gives users unlimited diagrams. It’s available for tablets, phones and desktops. This award-winning app and website are fantastic for those tricky moments when you can’t decide what to do. Unstuck offers a series of questions to help you pare down the problem to its bare bones and clarify your feelings, thoughts and action. It then offers some great suggestions about how to move forward. My trial run of the app proved really helpful. It honestly did “unstick” me. Not just for writing, Unstuck can help sort out relationship, professional, and personal growth issues too. This app combines neuroscience and music with a selection of carefully chosen sound tracks that “amplify attention.” The developers claim it can increase focus by up to 400% by helping users to filter out distractions. It’s a real boon for writers who have to work in noisy environments. You can try Focus@Will for free on a short-term trial, but if you want to keep using it, the subscription it costs about 13 cents a day. In my trial, I found the music tracks soothing, but I can’t comment on its powers to direct focus because I really don’t struggle on that front. If anything, I have the opposite problem. I have a bear of a time emerging from “the zone” without being hazy and grumpy. I wish someone would develop an app for that! Thanks, some great ideas there!